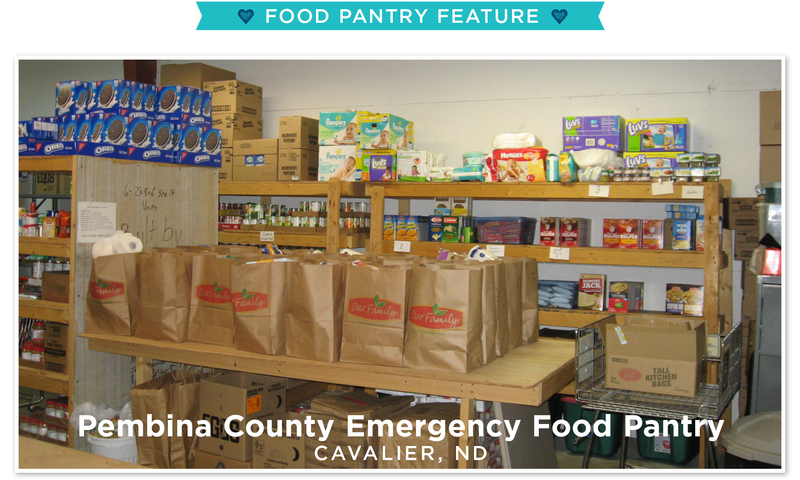 Michelle Murray has been President of the Pembina County Food Pantry for the last 12 years. Each week Michelle volunteers 2 hours of her time to the pantry because she enjoys helping families in need, especially the children and the elderly. She knows the service provided by the food pantry is greatly appreciated by the members of the community. One thing that drives Michelle to continue to serve others through the food pantry is having lived through tough times herself. Michelle has personally been affected by hunger and was able to utilize the food pantry during that time. Now she is able to spend time giving back through the food pantry’s services. Michelle wears many hats in the community; she is on the Pembina County Fair board, Cavalier Ambulance fundraiser board, Red River Valley, and Faith in Action. The Pembina food pantry is open every Tuesday from 3-5 pm. There is a mobile truck that comes once every three months. The pantry has 10 volunteers who take turns and also help with the mobile truck. The pantry serves 100 families with an average of 35 children. Each year there is an increase in families and individuals coming to the food pantry. The pantry is kept stocked with 95% perishable foods. All non-perishable items are available upon request. According to Michelle, the biggest hurdle the food pantry faces is knowing there are families in need who are hesitant to ask for help. Michelle hopes to continue being able to make a difference and help more of the community in need. The food pantry does not hold fundraisers. Everything comes from donations throughout the community. The hard part is that approximately 4% of the donations are thrown out due to expirations. Some of the donations are monthly given by the Presbyterian Rummage.